Works by Liam Scarlett, Greg Horsman and Christopher Bruce. Queensland Ballet, Queensland Performing Arts Centre, Brisbane, March 17. Death comes to us all eventually but does it have to come so cruelly and so soon to so many? Christopher Bruce’s Ghost Dances was made in 1981 in response to human rights abuses in Pinochet’s Chile but its relevance is, sadly, universal and continuing. It’s an important addition to Queensland Ballet’s repertoire and the key work in the Raw triple bill. Ghost Dances is simplicity itself. In a place somewhere between the real world and the darkness beyond, young people dance with joy and spontaneity to the intoxicating music of their homeland as three masked and painted malevolent spirits watch. The hard, muscular vigour of the masked ones is in stark contrast to the fleet, gorgeously fluid folk-inflected dances that speak of community and continuity. Bodies tilt and sway, feet flex, hands and arms link, legs kick up playfully and heads bob to the sound of breathy panpipes, warm guitars and drums (all the pieces are by Chilean group Inti-Illimani). But there are intimations of anguish too and no escape from death’s clutches. At the end those who had been so vibrant are drained of vitality. Not so the masked men. They wait for their next victims. Ghost Dances needs to be at once poetic and rough-hewn. This deeply affecting piece got those qualities from all 11 dancers in the first cast, who cast off the formalities of classical technique to dig deep into movement that takes its impulses from the earth rather than reaching for the sky. My eye was consistently drawn to Vanessa Morelli for the way she lived every moment with every fibre of her being. An unintended consequence of staging Ghost Dances is that it made Raw’s opening work, Liam Scarlett’s No Man’s Land (from 2014), seem too glossy and calculating in its effects. Scarlett didn’t shy away either from some well-worn effects. Take, for instance, the deep second position as a way of visually describing misery. We saw it in Ghost Dances, with the legs in parallel, and we saw it in No Man’s Land in turnout. Scarlett also unfortunately added a silent scream. Scarlett was recently announced as QB’s first artistic associate and the company will stage one of his works each year for at least an initial four years. I gather new works will alternate with existing pieces and it was inevitable that for 2017 a revival would be on the program. No Man’s Land was made for English National Ballet’s Lest We Forget program, presented in 2014. That year was, of course the centenary of the beginning of World War I and would have had much resonance in London at that time. QB programmed its own Lest We Forget commemorative evening last year, featuring a welcome performance of Paul Taylor’s Company B and new works by Brisbane-based choreographer Natalie Weir and Tulsa Ballet’s resident choreographer Ma Cong. Ma Cong’s In the Best Moments was negligible; Weir’s We Who are Left was affecting but perhaps a pièce d’occasion. Which is also the category into which No Man’s Land fits. Shorn of its commemorative context, No Man’s Land looked stranded. It has an impressive set (John Bausor) and lighting (Paul Keogan) that summon the inferno of a munitions factory during the Great War. Women have joined the assembly line in the absence of their men, whose images and fates they conjure and mourn to heavily orchestrated Liszt piano pieces, apart from the final section for piano only. The bombastic arrangements of selections from Liszt’s Harmonies Poétiques et Religieuses (1847) had the effect of overwhelming the emotional connections between Scarlett’s seven couples. Mia Heathcote and Victor Estévez were lovely in their pas de deux although one was aware more of the shapes than the reason for being. Even with the music heard as written for the big pas de deux at the end of the ballet, that section felt like a superbly crafted depiction of what pain might look like while, at least for this viewer, failing to pierce the heart. Ultimately No Man’s Land beautifies loss and sacrifice. Laura Hidalgo and Rian Thompson danced the final pas de deux heroically and it is undeniable that Scarlett creates movement that feels musical and organic even when most difficult. His weakness is in storytelling. As many before me have said, he needs help in this area. Only then will his abundant gifts be in the service of truly original and lasting work. Perhaps his tenure in Brisbane will help. Scarlett, who is still only 30, will be out of the international spotlight where he habitually works. It will be fascinating to see what emerges. Sitting in the middle of the Raw triple-header, Greg Horsman’s Glass Concerto tested the mettle, stamina, precision and speed of three couples as they were swept along by the mesmerising rhythms of Philip Glass’s Violin Concerto. After an early reminder of – homage to? – Twyla Tharp’s In the Upper Room, also to the music of Glass, Horsman gets into his own stride. Glass Concerto doesn’t break any new ground but it’s entertaining and lively, and it sure sets the dancers a raft of technical challenges, met better at the opening performance by the women than the men. The lovely second movement, in which calm, slow violin phrases sing above an undulating, fast-moving current in the orchestra, puts the spotlight on the lead woman. In the first cast principal artist Yanela Piñera’s calm authority and awe-inspiring strength – the woman is ripped – burned themselves into the retina. I liked that when the three men lifted her it felt in homage to her awesomeness rather than the usual balletic flinging about of a smaller person by a stronger bigger person. Alexander Idaszak partnered Piñera well and looked rather more at home with the quieter demands of the choreography than the allegro eruptions that Horsman has much fun with. Camilo Ramos and Rian Thompson also didn’t look quite as sharp as required when things moved into top gear although to be fair to Thompson, he’d put a lot into the preceding No Man’s Land. The secondary women, Lina Kim and Tamara Hanton, whizzed around like tops and looked terrific in George Wu’s black-with-sparkles costumes. As Glass Concerto continued the dancers shed a skirt here and a sleeve there. The effect was elegant and witty. It’s a pity QB doesn’t currently have the resources for live music at all performances. It was recordings all the way in this program, although as QB is in line for a boost in funding from the Australia Council perhaps there is hope in sight. A version of this review appeared in The Australian on March 20. After a year dominated by Giselle, Frederick Ashton’s The Dream, Alexei Ratmansky’s Cinderella, the lavish new Sleeping Beauty and Graeme Murphy’s Swan Lake, the dancers of The Australian Ballet were undoubtedly delighted to dive into the pared-back costumes and sharp-edged choreography of 20:21 (the title refers to the 20th and 21st centuries). They certainly looked as if they’d been let off the leash. The three works on the bill were well chosen – very different in choreographic style but sharing a clean, uncluttered aesthetic and each driven by a score to get the blood pumping. The oldest ballet, Balanchine’s Symphony in Three Movements, was made in 1972 to music by Stravinsky (written in 1942-45); Tharp’s In the Upper Room premiered in 1986, powered by Philip Glass; and Tim Harbour’s Filigree and Shadow is new, having made its debut in Melbourne in late August accompanied by a muscular commissioned electronic score from German duo 48nord. On opening night the women in white were rather less crisp than one would wish, nor did all of them convey the assurance and chic required to carry off the martial gestures, pony-step prancing, showgirl high kicks, jogging and more, but the three first-cast leading couples (Ako Kondo and Chengwu Guo, Lana Jones and Andrew Killian, Amber Scott and Rudy Hawkes) exuded command and sophistication. Scott and Hawkes danced the pas de deux with a sweet element of wistfulness as well as the lusciousness seen in swimming arms and entwining necks and the whimsicality of turned-in knees and hands. Scott, who is growing in stature with every season, was a glowing presence and also carried one of the ballet’s most enchanting moments as she whirled around the stage twice in a great circle of piqué turns as the corps jogged about insouciantly. Hawkes (a senior artist) and Killian (principal artist) danced in all three works on opening night. It was an impressive feat given the demands of each. Filigree and Shadow is a non-stop display of angst and athleticism. It looks and sounds thrilling and the opening night audience gave it a huge cheer in Sydney, as I gather they did in Melbourne at the premiere, so it seems a bit churlish to point out that it doesn’t really say much about its theme of “catharsis for aggression”. Still, the cast of 12 was as sleek as seals in form-fitting grey, super-energised by the propulsive music and performed with the cocky insolence of those who know they are, essentially, as gods compared with the rest of us. Brett Chynoweth, Simon Plant and Marcus Morelli were particularly fine in their trio and Vivienne Wong and Dimity Azoury gave no quarter in their encounters with Killian and Hawkes. The elegant contributions of Kelvin Ho (set) and Benjamin Cisterne (lighting) added greatly to the sense of occasion. Wong and Azoury then turned up as “stompers” in In the Upper Room, the ones who wear sneakers and do a lot of running in a work that joins the languages of sport and training with that of dance. Here – and this is very rare in ballet – effort is made explicit. This is a ballet of sweat and exhaustion as well as grace and artistry. The magic comes from seeing the reach for transcendence as Glass’s music pulsates inexorably and builds towards its ecstatic final movement. In a fine first cast, principals Daniel Gaudiello and Chengwu Guo were exceptional. 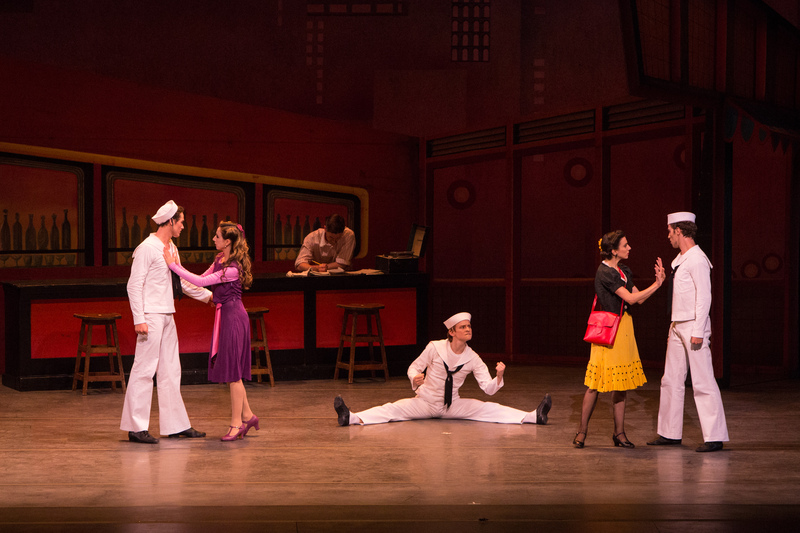 A program such as this also gives opportunities for dancers from the lowest ranks to have a moment in the spotlight. From the Filigree and Shadow first cast Plant is in the corps de ballet and Morelli a coryphée, and coryphée Christopher Rodgers-Wilson drew the eye in In the Upper Room. The Australian Opera and Ballet Orchestra had an early night, playing only Symphony in Three Movements (the other two scores are recorded). With AB music director Nicolette Fraillon at the helm the AOBO gave a strong account of this vibrant, rhythmically bracing score. Ends in Sydney on November 21. 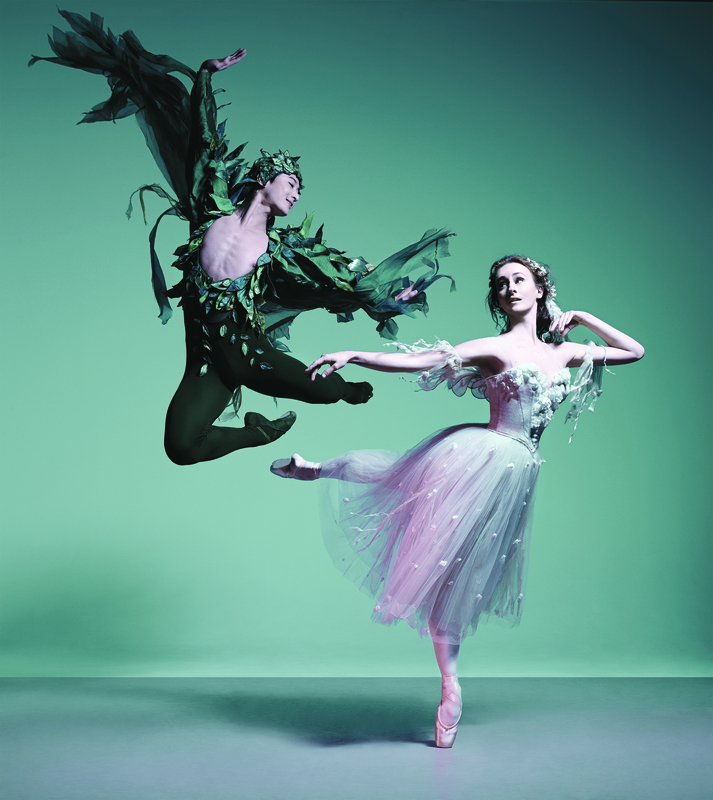 American Ballet Theatre, Lyric Theatre, Brisbane, September 5 and 6. TWYLA Tharp was never one to make things easy for dancers or viewers. It would take many more than the two shows I saw in Brisbane to absorb even a fraction of the beauties and complexities of Bach Partita, but it took only one performance to prove the work’s worth. It’s a knockout. Bach Partita is grand in scale, full of delicious detail and made with superb craftsmanship. There may be a great deal going on but no sense that the structure will not hold. It is a worthy partner for its score, Bach’s glorious Partita No.2 in D minor for solo violin, and was played wonderfully from the pit by Charles Yang, a true collaborator with the dancers. Tharp’s use of three principal couples, seven soloist couples and a corps of 16 women acknowledges the conventional hierarchy of ballet although Bach Partita is essentially a neo-classical piece with modern dance accents and attitudes seamlessly absorbed. The stage vibrated with energy as leading couples, soloists, flocks of corps women and secondary couples constantly changed the movement dynamics, attentive to those of the music. The first cast was led by Misty Copeland and James Whiteside, Gillian Murphy and Marcelo Gomes and Stella Abrera and Calvin Royal III, each with a different mood (sensual, vibrant, dramatic) but also able to come together for some moments before spinning off on their own tangents. I loved Tharp’s use of the secondary couples and the corps, whose comings and goings add texture and intrigue to the world of the main couples. The great glamour and individuality of the first cast wasn’t entirely replicated by the second cast, featuring April Giangeruso and Eric Tamm, Paloma Herrera and Joseph Gorak, and Isabella Boylston with Craig Salstein, although each was equal to the very testing technical demands of the ballet. But it was clear from seeing the first performance that Bach Partita also demands the mysterious but ultra-potent quality of distinctive stage presence. Herrera has it, of course; the others less so. That said, soloist Gorak is a particularly special dancer who has much ahead of him. Bach Partita premiered in December 1983 and was not revived until last year. It is a mystery why that should be so, but it’s back and it provided a rich, stimulating opener to this triple bill. 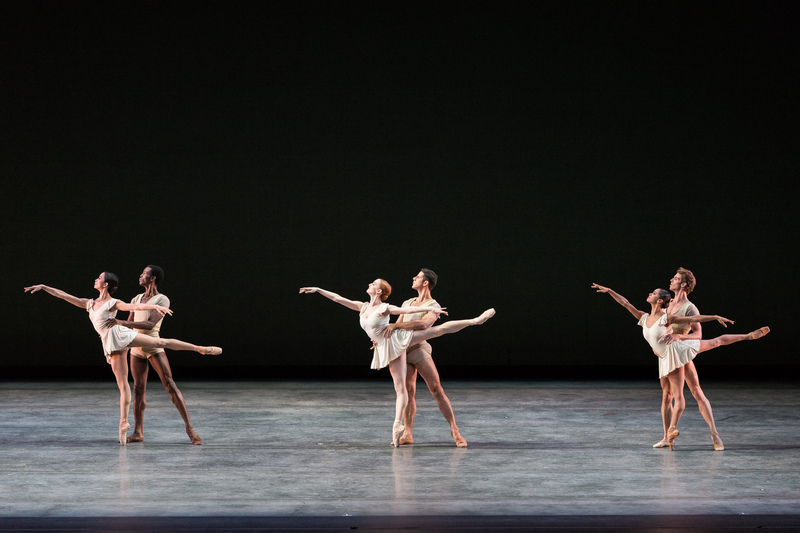 Three Masterpieces was a program designed to give a snapshot of American Ballet Theatre’s nearly 75-year history and included one much earlier work than Bach Partita and one much newer. Alexei Ratmansky’s Seven Sonatas was made in 2009 to solo piano pieces by Domenico Scarlatti, exquisitely played on stage by Barbara Bilach. The luminous music was interpreted by three couples whose interactions were playful, eloquent, romantic and occasionally something a little darker. There may have been no narrative but there were many stories. 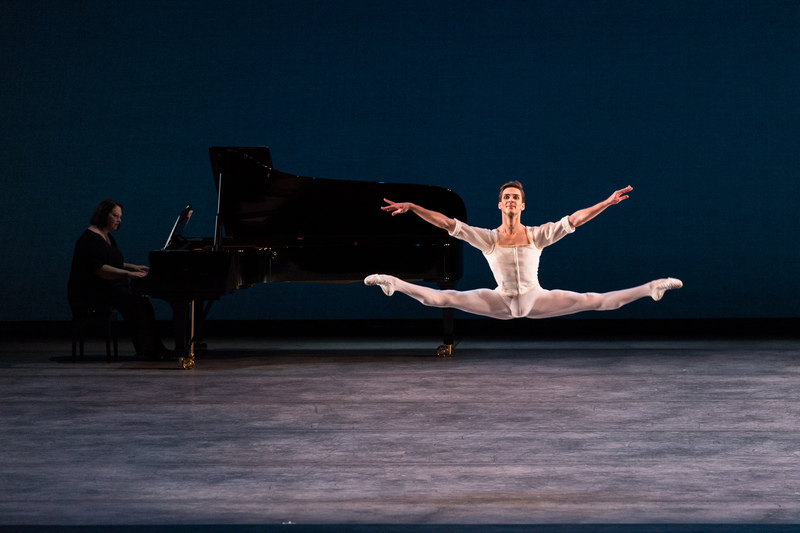 Although Ratmansky very much has his own voice as a choreographer Seven Sonatas is somewhat reminiscent of Jerome Robbins’s Dances at a Gathering, which is no bad thing. The first cast included Abrera and Royal paired again (they look so silken together), Gorak with fellow soloist Christine Shevchenko and Sarah Lane with the miraculous Herman Cornejo. The second cast gave an opportunity to see principal Hee Seo (with Alexandre Hammoudi) in a much more relaxed mood than she had been for the Swan Lake opening and to see lovely corps members Luciana Paris and Arron Scott together. Principal Veronika Part was partnered with corps member Blaine Hoven, who had been such a worried-looking Benno in the Swan Lake premiere. Here, in his poetic responses, it was possible to see what ABT artistic director Kevin McKenzie sees in him. The program came to a happy close with Robbins’s Fancy Free (1944), in which three sailors on shore leave come to a bar to let off steam and flirt with passing women. Its boisterous innocence, buoyed by Leonard Bernstein’s zippy score, was appealing and, in these most difficult times, touching. Casting was top of the line all the way, but it is impossible not to single out Gomes in the second cast. He was funny, charming and incredibly charismatic. I was disappointed not to see him in Swan Lake – he’s a stunning Von Rothbart on DVD – but Bach Partita and Fancy Free were pretty good consolations. It was fascinating to see the number of corps members given serious duties in both Swan Lake and Three Masterpieces. Well, they were principal dancer duties. A key reason is that ABT has only three ranks – principal, soloist and corps – so the best of the lowly ranked dancers get great opportunities. On the other hand it does appear difficult for them to enter the soloist ranks. At present ABT has 14 principal artists, only nine soloists and a corps of 60. The competition down there must be ferocious. A version of this review appeared in The Australian on September 8.